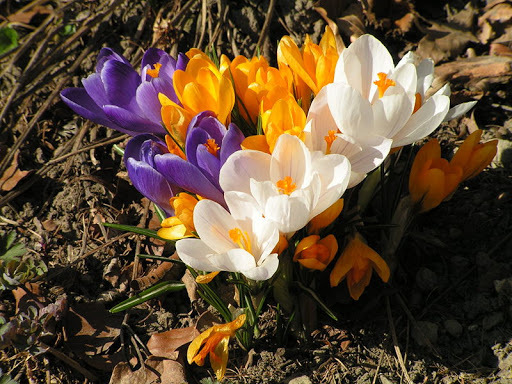 Ah yes, SPRING is nearly upon us, officially starting the 20th of March! Only a few short days! And for those of us in parts of the world that feel the need to mess with the time on the clock, Daylight Savings Time begins Sunday March 13. Yes, it is early this year. However, that means we get an extra hour in our day (Spring Forward/Fall Back) starting in mid-March, rather than mid-April! Think of what you can do! I’m hoping the extra hour will help me get out and start walking in the evenings after dinner. Do you have a plan for your extra hour? With spring upon us, as evidenced by the crazy weather, you know: raining one second, blazing sun the next, intermixed with hail showers, I felt it was time to help my body once again de-gunk itself. In the winter I tend to be, as many are, less active, more hunkered down in my house and I eat more comfort (read: heavy) food. With spring creeping up, it’s time to rid the body of the toxins and sludge it has accumulated over the last year. With that in mind, I started my spring cleanse yesterday. As a reminder, I use the Supreme Cleanse by Gaia, which can be purchased from any number of online retailers, nutrition or health food stores. It is about $25 for the two week cleanse. The lovely people at Gaia have updated the process so it is simply a “shake” mixture and two different capsules twice a day. It is now much simpler than the old plan which included multiple drops of various liquids throughout the day. 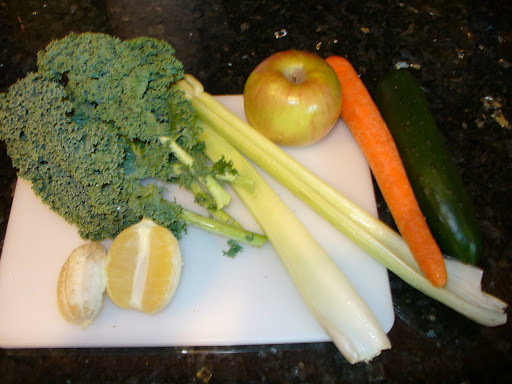 This cleanse is 100% herbal, natural and recommended to me by a naturopath doctor. It is not a harsh cleanse. Many people associate cleansing with much time spent in the bathroom. This is not typically the case for me with this cleanse. I do have side effects for the first couple of days. I usually have a headache and a general feeling of blah, which quickly dissipates and is replaced with a great feeling of energy and a “lightness” in my insides. I highly recommend this cleanse to anyone! Oh, the best part: real good food the whole time. 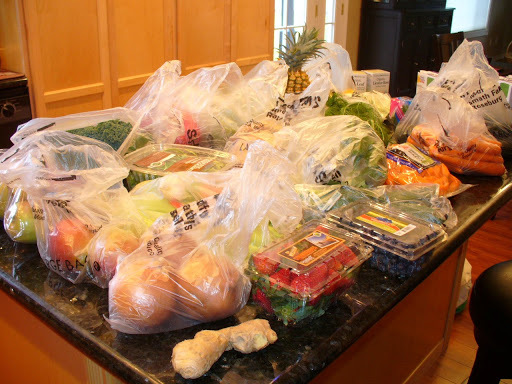 To get started I had to make a trip to the grocery store to stock up on fruits and vegetables. 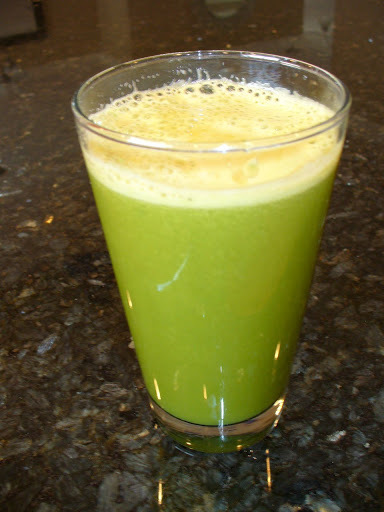 The cleanse food is mostly vegetables, fruits, fresh (homemade) vegetable juices, miso, fish, legumes, onions, garlic etc. No sugar, flour, wheat, alcohol, caffeine, etc. Clean, real, good, wholesome, whole foods! Very tasty. Don’t knock it till you’ve tried it! I know it looks funky, but it actually tastes quite good! Invigorating. I have also had some oatmeal with banana and raisin, some black rice with kidney beans and cumin, salad, banana, homemade blueberry and banana smoothie, some grilled cod and asparagus. Tonight though, I created a lovely dinner. My own creation with inspiration from several different sandwiches and recipes I have seen in my life. I am going to share it with you. Heat oven to 375 degrees. Heat the broth or water to a boil. While the liquid is coming to a boil clean the mushrooms and peppers. Remove the gills from the mushrooms with a spoon. Thickly slice the mushroom caps, approximately ½ – ¾ inch slices. Core and seed the red pepper. Slice into thick slices. Thickly slice the red onion. 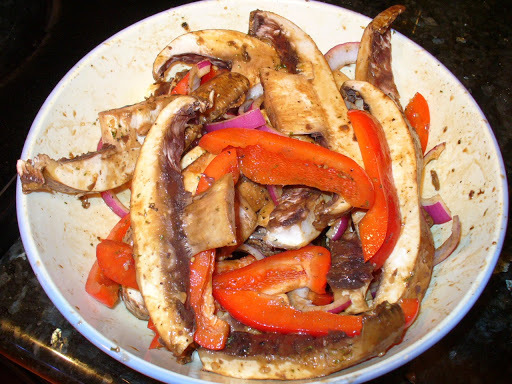 Add mushrooms, pepper and onion to a large bowl. In a separate bowl whisk together the marinade; olive oil, balsamic vinegar, Dijon mustard, garlic and parsley. Pour marinade over the mushroom mixture; toss to coat. Let mixture set for 5-10 minutes, tossing again to coat. Pour the quinoa into the now boiling liquid. Cover. Reduce heat and low simmer for 15-20 minutes, or until all of the liquid has been absorbed. Remove from heat, fluff with a fork and it is ready to serve. Place the mushroom mixture into the bottom half of a broiler pan or into a casserole style dish. 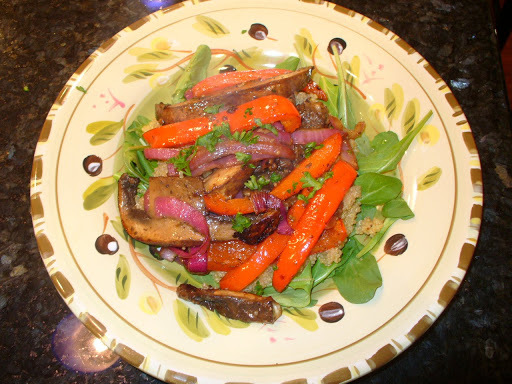 Cook for 15-20 minutes at 375 degrees or until onions and peppers are soft and mushrooms have started to darken. Place ½ cup of arugula onto each plate. Top arugula with ¾ – 1 cup of quinoa. 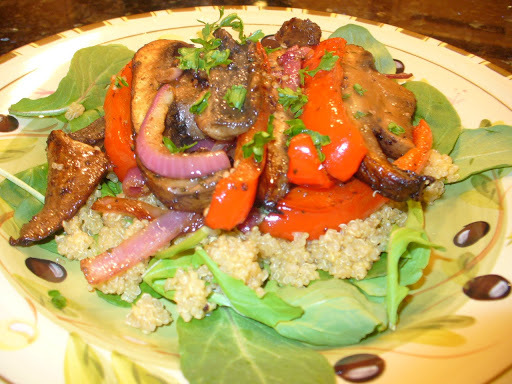 Place approximately half the mushroom mixture over the top of the quinoa. Place a sprinkle of the fresh parsley and a drizzle of lemon juice over the top of the entire plate and serve. It will look something like this and taste wonderful! You *could* have leftovers, but you probably won’t! With food like this to eat…who even can tell that I’m cleansing!! My kind of “diet”! I’ll keep you posted as the next couple of weeks progress! Marcela- tell Brian to just eat it! It's good!Otherwise, if you want to stay vegetarian I would say eggplant would be a good substitute, or zucchini…whatever you like. If you don't care about staying vegetarian on this I would say marinate and grill a flank steak and then slice it like the mushrooms. It is SO yummy! This looks so good I think I am going to have to try your recipe out. Brian isn't a fan of portobello mushroom's so I will have to substitute those have any idea's what to use? Oh Shorey- It was SO good…After we went to bed Chris told me he wished we had some more so he could go eat it! LOL! That looks really good even at 5:00am. This entry was posted on March 9, 2011 by Corrie Beebe in Uncategorized.